Chose the Fully Assembled board with LED strip connectors or a Kit without the connectors. 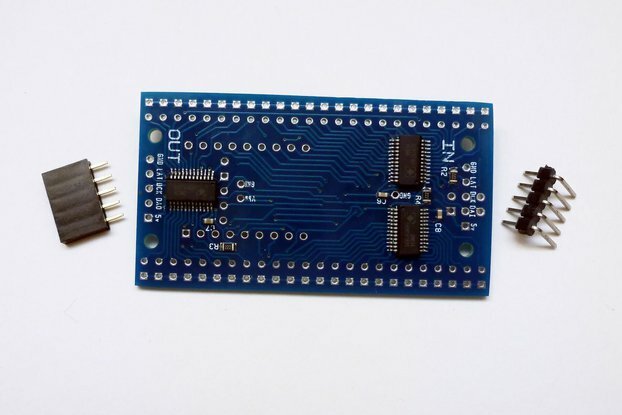 If you chose a Fully Assembled board you may wish to have the pin headers unsoldered to manually connect wires. The board is effectively an Arduino variation designed to run 5 RGB LED strips. Maybe someone out there is in need of exactly this stuff (at least, I was searching for something like this a year ago and ended up doing my own board). 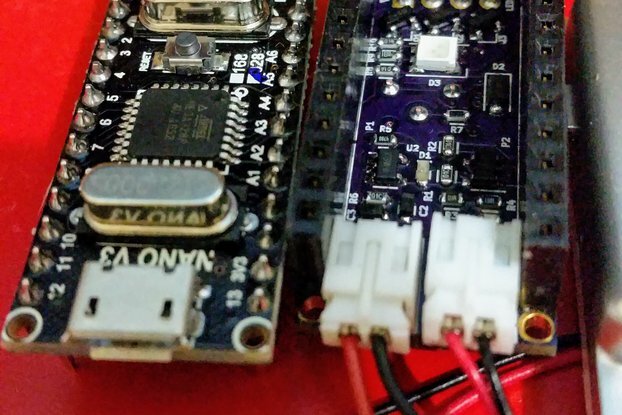 THE BOARD has an Atmega328 chip (same as Arduino Pro Mini), a 12-bit DM633 LED driver with own PWM engine, a 5v voltage regulator, 15 MOSFETs controlling RGB outputs and 1 master MOSFET to turn LED strips on and off. 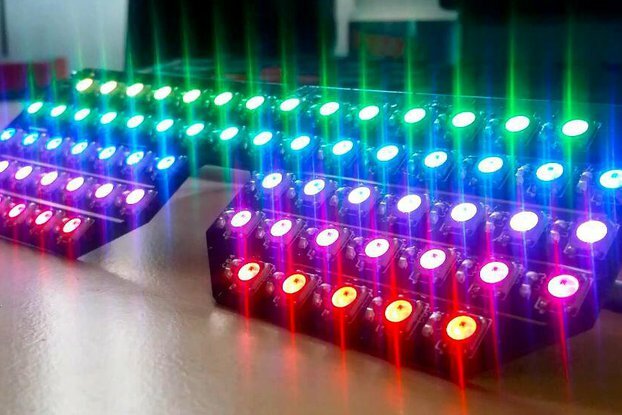 Up to 5 RGB LED strips can be connected. The board was tested with five 1 meter strips and 6A power supply. It should support up to five 5-meter strips with a proper power supply, but this was not tested. Longer strips are not supported (use external RGB amplifiers). All not-in-use Arduino inputs/outputs are available (check the Datasheet fro more info). Additional resistors are installed: 4.7K pull-up on A2 pin (1-wire port); 10K pullup on A0 (useful with photoresistor). The outputs are grouped for easy installation of IR receiver (D2) and two buttons (D4 and D8). POWER SUPPLY: the board is programmed with a 5v supply and runs on a 12v supply. The 5v supply is not needed when the board is working. 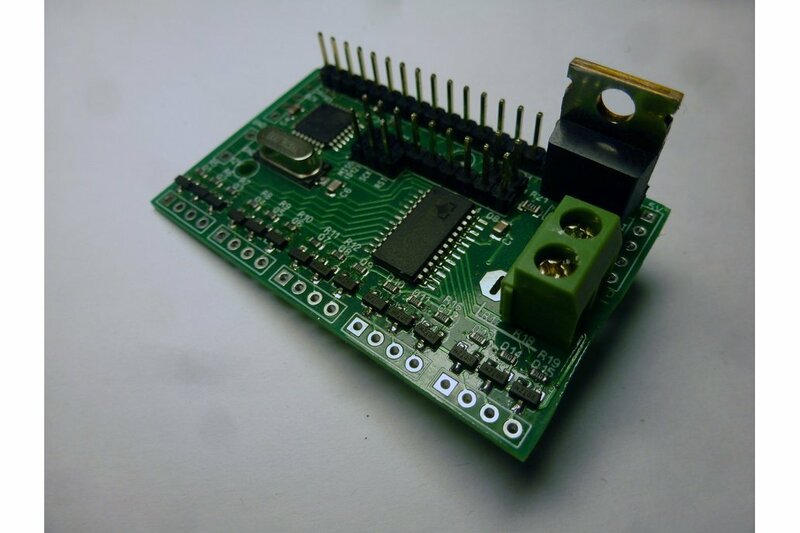 This board is designed to be PROGRAMMED via ISP interface (an external ISP programmer or an Arduino running ArduinoISP sketch). RX, TX and DTR (UART) connections are present, bootloader is pre-installed. The sketch provided can be used to easily program the DM633 LED driver (although the tlc5940 library seems to work fine too). Note that the programming here follows an inverted logic, namely, 0 means ON, 4095 means OFF. The master MOSFET helps avoid flickering at startup. 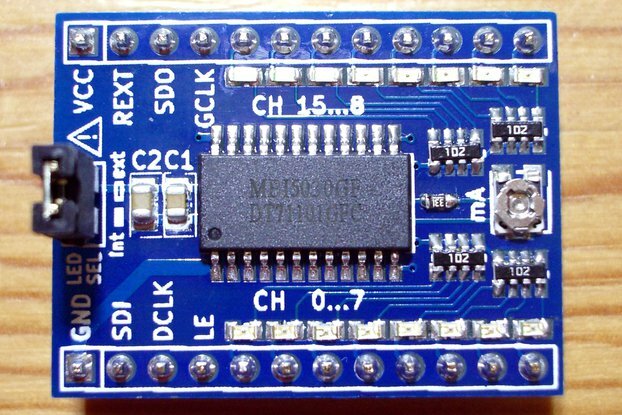 The board will be supplied with an Arduino bootloader and a demo sketch preloaded. It is possible to connect extensions to this board, thus expanding the number of controlled LED strips. The extensions can run on the same 12v power supply or have their own ones (in the latter case the master MOSFET won't be able to turn them off). These extensions are basically the same board without the Arduino part: just an LED driver chip and MOSFETs. Please contact me regarding details if interested. OPTIONS: You may choose the Kit version that DOESN'T INCLUDE LED strip connectors. This gives you more opportunities in selecting the exact connectors you need (jack, length, etc). The Soldered version includes LED strip connectors (10mm). You may also choose the type of the power connector (jack for the standard LED strip power supply or a terminal for a power supply with loose wires) as well as the pin headers type (male/female). The assembly and use instructions are included as a Datasheet (check to the right).